Most of the time, Alabama’s climate is mild, and we can grow food year round. Our collards and kale are cold-hardy to around twenty degrees, but multiple days in the teens and twenties is a challenge to the hardiest plants. (Last Tuesday morning, my phone reported a projected low of 21 with a current temperature at 7:30 am of 14 degrees!) We use a spun fabric called floating row cover (Agribon) to help insulate some of our beds, and today, we uncovered the beds, unwrapped the trees and are taking stock of what might survive and what is just done. What did really well - collards! We planted Champion and Alabama Blue varieties of collards. The Alabama Blue looks the best - almost like we had no cold at all. The Red and White Russian kales are looking pretty good, too, along with the King Richard Leeks which can survive in ten degree weather. The raab is done for, yellow, melted, but the overwintering broccoli looks like it will make it. The kohlrabi is hanging in there, too, and we should have some for market Saturday. The carrots lived to see a future market, and the beets are frost burned but hanging in there. Chard (related to beets) basically melts in the deep cold. 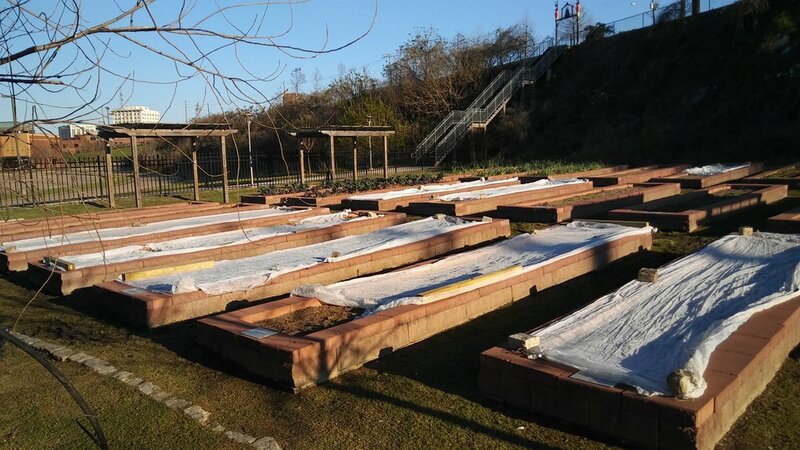 We covered our chard beds in two to three layers of row cover. We won’t be eating chard for a while, but we think the plants will make it. Our late October seeding of spinach is also still alive, but extremely tiny. The weeds are looking good. They must be hardy to below freezing! Dandelion is blooming by the gate, and the henbit stands between the collards are quite healthy. Even some of the aphids survived. The cat, ducks and chickens all had indoor access, and the chickens had their own heat lamp. (Look down at the farm on a cold night, and the top of the coop glows red!) The bees were flying today, and all the critters were glad to get out for a snack of green after all of the cold. How is your garden faring? Have you observed some especially hardy plants (or weeds) in your garden? Do you have your own garden strategies for dealing with the cold?